It’s interesting, but kind of hard to understand what the visualisation means. I can see a cluster of list processing languages over to the left, and OO languages in the middle. But why does Algol get so far separated from Algol 60 and Algol 68, with FORTAN and Pascal in between. I guess the actual locations are artefacts and we should see distances in terms of steps that are hard to see. But I can’t see a direct link from Algol to the others, or from Pascal to Object Pascal. So is this visulaisation seductive but ultimately thoroughly misleading, giving a veneer of sense but hiding away really bad underlying data? PS FWIW, I think one of the major benefits to be had from these sorts of visualisation is in support of a visual analytical conversation between the analyst and the data. It also helps, as you say, to identify those cases where there may be something wrong with the data (as Martin Hawksey says, “data use == data validation”), which is an important part of the process of working with data. One thing I try to avoid doing on the blog is produce anything that might be construed as being intended as a ‘finished graphic’. Pretty much all of the “visualisations” I post here are sketches, snapshots of a process that is an ongoing conversation between myself and the data, and that as a consequence is only really meaningful to anyone who is aware of the full history of that conversation. 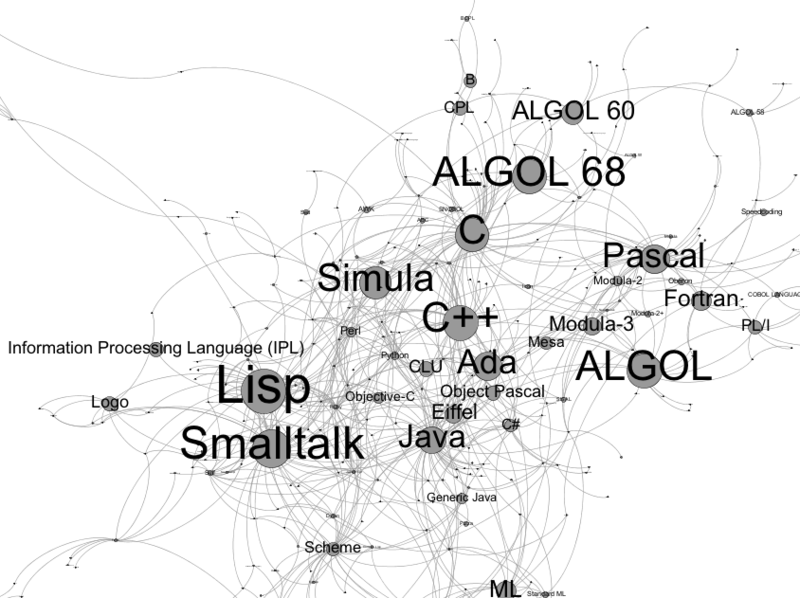 The programming languages image was intended simply as an illustration of the structure of the data and some of the manipulations that could be applied to it, rather than as a meaningful visualisation. And it was not my intention at all to claim it as a “true” statement about the relationships between computer languages. At the most, it is a statement made about the claims made within a set of Wikipedia pages (a set that is opaque to me) that make use of a particular structured relation in a particular context.